The startup environment in Taiwan has been thriving over the past few years. Business incubators and accelerators are sprouting fast; young entrepreneurs long for funding, while investment companies seek future sparks. Apart from matching startups with investors, it is crucial for startups to gain enough funding as the first step. Yet, before all starts, the core is to visualize their creativity and the right technique is the key. Many startups encounter difficulties that their technologies don’t essentially support visualizing their ideas during the process. For instance, they might not be able to improve the yield rate or optimize their technology; or they get the former solved yet with uncontrollably high cost. These startups possess creative and innovative ideas but lack professional technology to underpin them; and the lack of experience sets a high hurdle in front of their paths to visualize their products. Even after they make it to visualize their products, they are yet to start making money before their materials and designs get verified by governmental regulators. That may sound time and effort consuming, but it surely costs more to find out more unsolved red tapes when the products are ready to be on line. Mix Taiwan, a salon for creativity and technology exchange hosted by the Ministry of Economic Affairs, with the theme to ‘share the know-hows’, aims to educate young entrepreneurs with inside technology with depth and breadth, to enlighten them with the knowledge for creativity visualization, and to foster knowledge exchange and distribution. New and imaginative ideas don’t necessarily get turned into reality most of the time. Lack of a grasp of key techniques and an understanding on the market trends might unintentionally put out the sparks of good creativity at times. 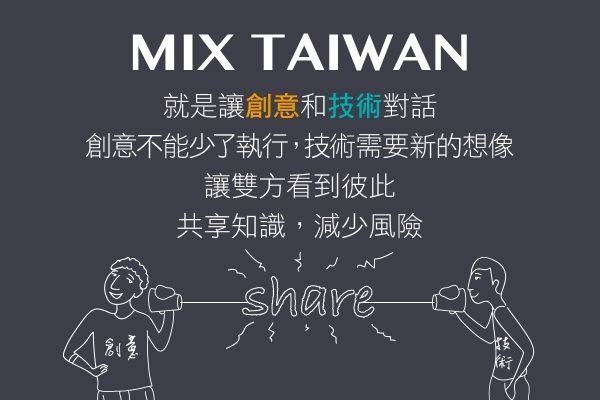 The Mix Taiwan platform pulls together creativity, techniques, and trends and intertwines them into a resourceful cradle from which startups grow. It takes more than just creativity to realize startups’ ambitions. 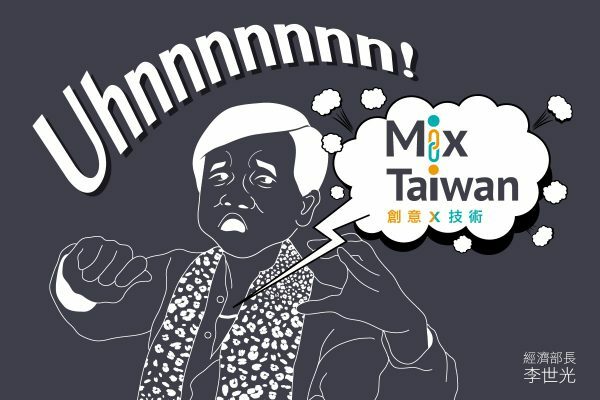 It is the mission of Mix Taiwan, as the first interdisciplinary creative platform led by the government, to assist them to understand the industry trends, to grasp key techniques, and to exchange talents and knowledge, from creativity, techniques, technology, to product designing. Mix Taiwan not only provides a platform for dialogues within the private sector, but also paves a way for those voices from the private sector to meet that of the government. 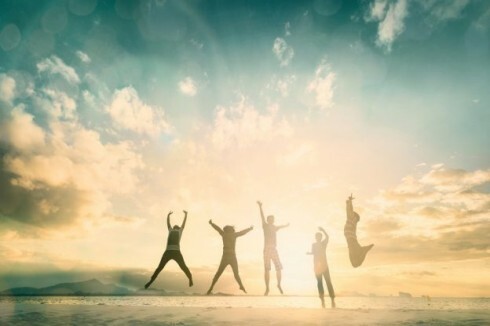 It creates a better environment for startups in Taiwan, helping them root in and grow up. Staring from January 2017, the Ministry of Economic Affairs will host ‘Mix Taiwan Knowledge Exchange Salon’ fortnightly throughout the year, with a total number of 14 gatherings. It invites startup entrepreneurs and opinion leaders to be soapbox orators, nonstop giving local and international information from voices of a mastermind, a tough guy, and a specialist. The salon follows a series of systematic themes, with different materials and opinions each time, and aims to spread, communicate, and pass down the startup culture. The salon is hosted at a fixed venue and time slot, yet it is also accessible through live streaming outside the fixed place and time. Mix Taiwan is also the first platform allowing the private sector to directly communicate with officials and experts from the government. Aside from exchanging techniques and knowledge, attendees are also able to know the government’s roles in different fields through Mix Taiwan, which helps bond the two sides tight together and form a business brain of originality of Taiwan exclusive from the others. In addition, Mix Taiwan will also host ‘Brand Activation Forum’ at IFoundry Maker Space, Taipei Tech, at 7 pm on 19th of December, 2017. It invites Chih-Kung Lee, the minister of Economic Affairs; Lee-Feng Chien, the Managing Director of Google Taiwan; and Audrey Tang, a minister without portfolio at the Executive Yuan, to be A-list heavyweights to share their experience at the first gathering. It also invites Dr. IC, the founder of Fitmily; and Sega, the CEO of LIVEhouse.in, to be guest speakers. Other entrepreneurs and opinion leaders from different fields will also participate in the forum. Keywords like “startups” and “technology” have been going viral in Taiwan over the past few years. More and more young people have joined the trend to keenly visualize their creativity and imagination. However, each entrepreneur has to realize that he or she needs the right technology and the understanding on the industries, also known as the ‘solid foundation’, to drive their enthusiasm and creativity, their ‘soft power’, forward.